This post is longggg overdue but I finally got around to it! Last semester, I was given the opportunity to present in my social media class about my blog and boy was I scared. Not only because I have a lot of anxiety when it comes to public speaking (that I'm finally getting around to overcoming but that's for another post!) but because I'm sharing such a huge part of my life with my peers. It's not like I keep it a secret or anything, if it ever comes up in conversation I definitely mention it but presenting it to a class on a professional level can be intimidating. Face it, us bloggers and social media gals aren't always taken seriously despite the ridiculous amount of effort that we put into our work. What would they think of a girl like me who talks about her outfits everyday?! To say that I was nervous was an understatement. I was thinking about how to present it for two months straight! In the end, there was nothing to be nervous about because the reaction from my audience was crazy positive and supportive. Since I never see posts about this kind of stuff, I thought it was time to finally share some tips with you all that helped me get through it. Let's start! Be Humble - This was one of the things that I was concerned about from the very beginning. I hate talking about myself. It's just not my thing (I prefer to write about myself on my blog instead haha). So how do I talk about myself and my accomplishments without sounding like a Kardashian? Keep it professional. Remember the point to any presentation is about educating the audience. Talk About the Struggle - Most people don't know about the challenges of being a blogger. They don't know about the long nights that we work, how difficult it is to monetize, and how discouraging it is to have many people in your life not taking you seriously. Every professional goes through hardship so talk about yours. Not only will this make you look more down to earth, but people will be able to relate to you. Humor - Typically when I do any sort of presentation, I like to add in a couple jokes and sarcastic comments here and there (my professors know I'm sarcastic, they don't mind lol) because I've noticed it always keeps the audience interested and awake. Plus if you're nervous about presenting, it helps you to relax when you notice that everyone is laughing at your jokes and actually enjoying your presentation. Dumb It Down - Not everyone gets blogger jargon. Make the concepts easy to understand and simple. This will not only help others to understand blogging better but it gives you less anxiety since you don't have to remember anything complicated. Practice With a Blogger Friend - When I was preparing my presentation, I asked my blogger bestie Kiara from Blissfully Brunette for some feedback and luckily she already made class presentations on her blog so she was able to give me some great advice on it. It's always nice to get a second opinion! Watch the Experts - Due to my paranoia, I began watching Youtube videos of blog conferences and influential people in general giving presentations and began to take note of what they were doing. The funny thing is, I've attended blog conferences before and never really paid attention to the way people spoke until now. Even the most famous speakers make mistakes while talking yet they move on and don't show their nerves. You're probably the same way! One thing they all had in common was how passionate they spoke about their work and you can tell the people in the audience were feeling inspired. Watch a couple videos and see if you can adopt some things into your own presentation. Overall, remember how lucky you are that you even got the chance to do some public speaking and educate people about blogging! This means that people are taking you seriously and want to know more about you. A lot of bloggers (including myself back in the day) dream about opportunities like this. I know it's painful, but get out of your comfort zone and I'm totally gonna sound like a Nike ad here but just do it. You'll be glad you did. This is such a great post, Ruya! 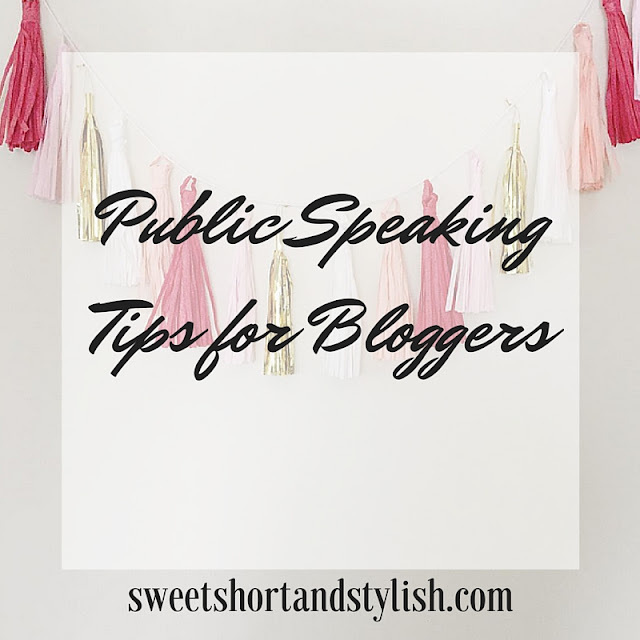 Public speaking kills me every time and even though people know I blog, I would probably panic if I ever had to give a speech about it to my peers at school. These are seriously awesome tips! Great idea for a post! Love all of these tips! You nailed this post, girl!